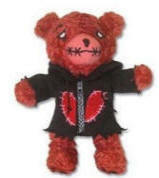 If you like happy-go-lucky Barbies or cuddly teddy bears, the following horror-inspired and goth toys are NOT for you! But we think they are just peachy! Yes, these toys are a bit creepy - but very cool! If you are interested in collecting scary toys or creepy dolls, UglyDolls, Skelanimals or the Teddy Scares and the rest of our featured finds would be the perfect start for your collection of scary toys and collectibles. soft and cuddly...just don't mess with them! If you have a hankering for horror toys, don't look further. We have fallen in love with Teddy Scares stuffed bears. They're cute, they're cuddly - but a little bent! Teddy Scares are "evil zombie bears." So be sure to keep one eye open when cuddling up to one of these guys! Last Words: "Trust me, it won't hurt." To start with, what's creepier than a doll? This popular opinion is what inspired the creators of The Living Dead Dolls, Ed Long and Damien Glonek. Long and Glonek are (and we quote), "horror-fiends" so their dolls truly come from their heart and a passion for horror. They have created an evil empire of devilishly creepy dolls. Lottie (left) is a personal favorite as well as the lovely Lulu (right) Each doll comes with a death certificate and a handsome coffin! These dolls make us want to watch that "scary doll movie" with Karen Black, 1975's, Trilogy of Terror. In the last third of the trilogy called Amelia, Black has a bloody tete-a-tete with a Zuni fetish doll. Once it's protective chain slips off, it comes to life with a fetish for murder. Very creepy - see The Voodooz below! 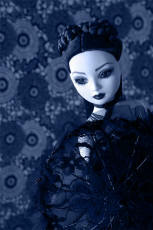 Interested in more goth dolls? By chance we came across these gorgeously melancholy and sadly beautiful dolls and had to showcase them on Boo. Their names are Ellowyne Wilde and Evangeline Ghastly. I want my name to be Ellowyne in my next life. Ellowyne Wilde was lovingly created and sculpted by the talented Robert Tonner. He not only created the dolls themselves but their costumes as well. We can identify with Miss Ellowyne sometimes, she's bored quite a bit and suffers from a touch of melancholy. This little depressed girl needs to cheer up, but she is after all a girl after my own heart. Oh did I forget to mention that she loves herself a cup of coffee! Then there's Evangeline Ghastly. 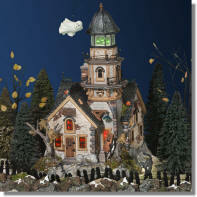 She was inspired by Tim Burton’s The Corpse Bride, The Addams Family, and even Barbra Streisand. She was created by designer Joe Petrollese and sculpted by Robert Tonner. She was born in the attic of Barkely Manor, loves to dress herself in gorgeous goth, Victorian clothing and owns a pet skunk named Mouette. Not too sure if she's a ghost or living, but whatever form she takes, she is a work of art. animals do make better companions - dead or alive! We just discovered the coolest scary toy - though "dark" in concept, they are actually very adorable, funny and cuter than any stuffed bunny we've ever hugged! So who or what are these hip little darlings? They are the fashionably bony Skelanimals. Skelanimals feature a variety of "dead animals" to collect and love... and they glow in the dark! 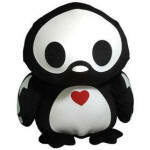 They come in 8″ plush toys, beanies, vinyl figures, keychains, back packs, breath mints and more. They've even invaded fashion: apparel, underwear, handbags, shoes and jewelry. Skelanimals are soon to be the next Hello Kitty - just a bit on the goth side - but still oh so cute. Like Teddy Scares and Living Dead Dolls, each Skelanimal has its own distinct "personality". Each Skelanimal even has its own favorite scary movie! Pen the Penguin's (left) favorite scary movie is "Orca, Orca"
The first series of plush toys includes Thomas the Hippo, Quackee the Duck, Pen the Penguin and Elle the Elephant (right). Others include: Jack the Rabbit, ChungKee the Panda, Dax the Dog, Marcy the Monkey and Kit the Cat. We also just love the tag lines of the Skelanimals: Dead pets are so easy to keep! Dead animals need love too! Manufactured by Toynami (big with the anime action figure market), Skelanimals was created by artist and designer Mitchell Bernal, so they must have an edge. The toy market has seen creepy dolls, deadly teddy bears and now the skeleton of animals. We like this trend! 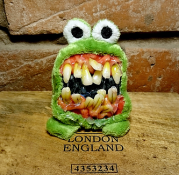 It's really hard to consider these adorably cute plush toys ugly, horrific or scary. We actually think they are rather cute - guess beauty is in the eye of the beholder. However, they are a wee bit different than your average toy. Uglydolls were created by independent toy designers David Horvath and Kim Sun-min and first released in 2002. They have already been recognized when in 2006, they were awarded the Specialty Toy of the Year award by the Toy Industry of America. The Uglydoll collection were first made in 12" plush and were handmade by Kin Sun-min. 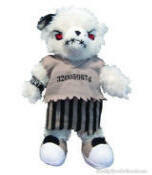 They now are available as 7" Little Uglys, 24" Giant Uglys, 4" plush key chains, and 7" vinyl Uglys Each doll includes a small tag describing the character's distinctive persona. appears briefly in the 2005 film Zathura! Tray is the brains of the Uglydolls. so blue is because she eats so many blueberries. 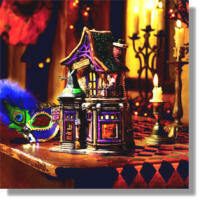 If we were to live anywhere, it would be in a Department 56 Halloween Village. Ok, maybe you can't really live in one, but you can decorate the heck out of home or apartment with them. What are they? 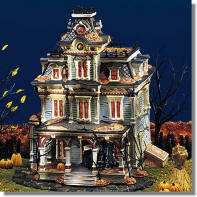 They are intricately detailed porcelain pieces done up with Halloween in mind. Some come equipped with colorful, blinking lights, some with eerie sounds and others with moving pieces. 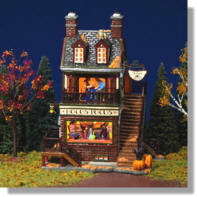 Halloween would not be the same without setting up my collection of Department 56 Halloween Village. Perfect as a Halloween collectible. Department 56 comes out with new pieces every year while retiring older pieces. And these retired items can really become valuable on ebay. Some villages, including some retired villages include: Shipwreck Lighthouse, Be Witching Costume Shop, Grimsly Manor and Helga's House of Fortunes. These horrorific collectible cards, popular in the 70's, have a ghoulish, twisted quality and sometimes downright creepy images. Wacky Packages were first made by Topps bubble gum in 1967 and were basically parodies or spoofs of everyday consumer products - from Kentucky Fried Chicken to Listerine. They were the size of baseball cards and contained a piece of bubble gum and some Wacky Packages. The good news is they are still being made today - as well, they are very popular on ebay where you can still locate all of our old favorites. ...now that's our kind of celebrity! 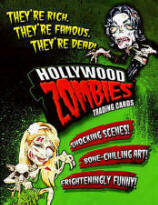 Hollywood Zombies are new scary collectible trading cards introduced by the Topps Company. Just like Wacky Packages, they are creepy and hilarious. Instead of spoofing well-known consumer products as Wacky Packages have done, Hollywood Zombies spoof “celebrities” and their lifestyle. Poking fun at the lame celebrities of today, these cards show them in their true light! The series has 72 parody cards including such notable celebrities as Martha Skewered, Nicole Retchie, Wacko Jacko, Britney Speared, Paris Hellton and Lindsay Loco. Some extra surprises! One in every four packs contains a glow-in-the-dark “Morbid Mug Shot." Hollywood Zombies have already caught some media attention of their own. They’ve been featured in Spin, Entertainment Weekly and Wired magazine. They’ve also been seen in USA Today. Teddy Bear Nightmares are adorably grotesque, handmade teddy bears found on Etsy.com. Like The Teddy Scares, these "cuddly" teddy bears are not really the kind of cuddly and comforting teddy bears you remember from childhood....more like from your nightmares (hence their name). The creator of these teddy bears reincarnate these once sweet teddy bears from Goodwill and garage sales and turn them into something devilish! We really appreciate the creepy artisan quality of these teddy bears. some time scratching his head he finally figured out what he was hungry for...bears! ...unspeakable terror in a soft, adorable package! 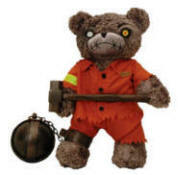 Terror Teds are going to make any horror-lover's heart burst with joy. These horrific cuties are all hand crafted using professional grade materials and hand painted. Every single tooth and bone on theses creations are hand made and painted with high quality FX materials. They use lots of liquid latex to create bloody wounds and drooling mouths! VERY realistic! At Terror Teds, not only will they mutilate poor 'ole teddy bears, they will even ravage the sweetest of bunnies and kitties! Those bastards! They also offer Tiny Terrors, smaller terrors that would look awesome sitting on your desk at the office. They have even introduced an animatronic teddy bear that talks and moves! My heart swoons! You can also have them custom make your own teddy! He is just dying to take a bite out of you!